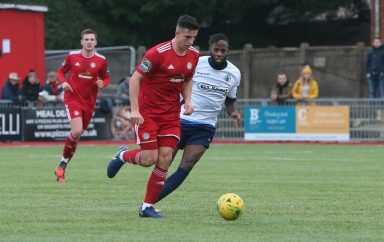 It was a case of The Late, Late Show at The Fullicks Stadium, as David Ajiboye pounced in the eighty-eighth minute to end the hosts’ thirteen-match unbeaten home run. Someone must have spiked Hinsh’s pre-match drink; with the side not showing any changes from last week and only Ty Mthunzi coming in for Jasper Pattenden on the bench. In a game between two long-standing rivals, it was the host’s right-back, Josh Vincent, timing his run to meet a right-sided corner but unable to keep his header down, after only two minutes. Reds responded immediately as Jalen Jones’ throw-in was headed on by Callum Kealy to Ollie Pearce; who’s sweetly-struck volley dropped onto the top of the crossbar to deny him a stunning opener. The visitor’s next attempt saw Ross Edwards find David Ajiboye to his right and his run into the penalty area was eventually brought to an end by Finn O’Mara, who scrambled the ball to safety. Another throw-in, this time taken by Pearce, lead to Kwame Adubofour-Poku playing in Jesse Starkey, who bulldozed his way through towards the left-hand side of the box but could only find the side netting upon getting his shot off. The otherwise untroubled Tim Roberts, in the home goal, earnt his corn with two top-draw saves in quick succession. Pearce drifting in from the left and forcing the custodian to go full-length to keep out his piledriver, before having to be equally alert to keep out Kealy’s well-struck screamer from the edge of the area from the resulting corner. 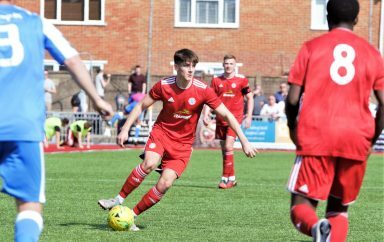 Captain, Joel Colbran powered his way into the danger zone and fired narrowly over the bar, after starting near the right-hand touchline and Starkey’s effort drew a finger-tip save out of Roberts, as the away team looked to make their pressure count. Folkestone then turned the game on it’s head by dominating the remainder of the opening period. 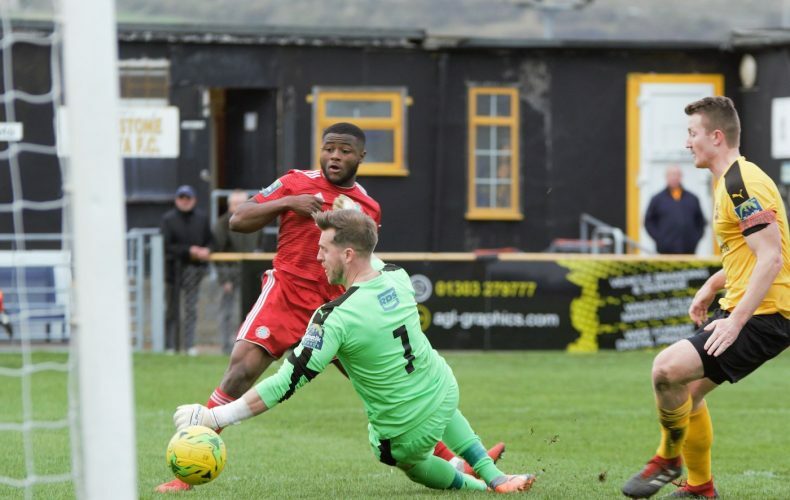 The lively-looking duo of top scorer, Ade Yusuff and former Worthing play-off winning winger, Ira Jackson combined to get Lucas Covolan’s gloves dirty, when the former saw his low effort held by the Brazilian, after he’d glided across the top of the penalty area. An offside decision then put paid to Scott Heard’s celebrations, after it seemed that everyone in a yellow shirt had tried, one way or another, to force the ball home. Five minutes before the break and similar link-up play between Jackson and Yusuff, resulted in the latter this time testing the strength of the crossbar, as his turn and shot had Covolan beaten but not the framework. Michael Everitt had two final chances to put his team in front, as the clock ticked steadily towards half-time. Firstly, Lucas pulled off a stunning one-handed stop to deny Invicta’s all time leading appearance holder, then he got down to hold on to a second header, from a flag-kick. The start of the second forty-five had Covolan rushing out to snuffle the ball off Yusuff’s toes and Ajiboye giving Roberts an easy save, until “The Double Act” threatened to open the scoring. Yussuff breezed past Alfie Young and tried to tee-up Jackson, only for Jones to get his body in the way and then Edwards’ presence proved to be enough to prevent the lively number ten enjoying a second bite at the cherry. Ira left Alfie feeling a little irate when he seized on the centre-half’s mis-kick but not for long, as he failed to test Lucas at the near upright. 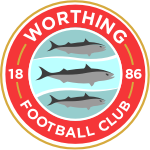 Worthing woke up to eventually respond through Pearce’s free-kick, that was met with a beautifully cushioned volley by our very own Club Shop Man, Mark Brett, straight back into a crowded area…on the terrace, as the delayed set-piece flew over the target. Jones charged down Draycott’s attempt from distance before Alfie Paxman slipped in Yusuff down the inside-left channel and he, upon squeezing past Colbran, could only shoot behind rather than in front of goal. By this time, however, the hosts had been reduced to ten men, when Jones’ run – that finally came to an end by the byline – was abruptly halted by Nat Blank’s second “foul” of the afternoon. Joel stopped Jackson’s pass finding it’s intended recipient and he could only blast over the bar after winning back possession off Jones, much to the centre-back’s relief. Inside the last ten minutes, Ajiboye’s cross found Kealy in the middle and substitute, Joe Clarke steaming in at the back stick but also an assistant’s flag up. Our leading scorer was then located from the left by Aguiar but couldn’t keep his header down, with O’Mara earning himself a second yellow card for delaying the subsequent goal-kick. Then, just when you thought it was all over, Ajiboye came in off the right flank, drove into the box and tucked the ball under the left armpit of Roberts and, despite the best efforts of Captain Callum Davies, it was adjudged to be over the line before Kealy made absolutely certain.